What most caught my eye on my first ride through Istanbul was its many hills and many mosques. 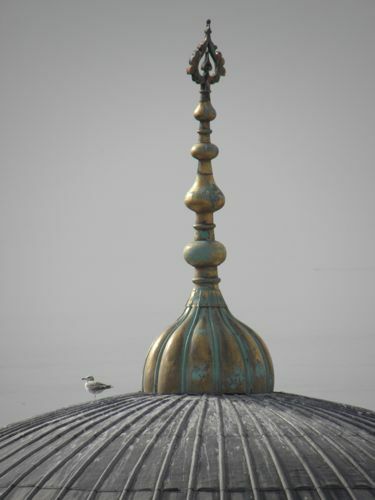 Every neighborhood had a dome, each punctuated by at least one minaret spiking toward heaven. 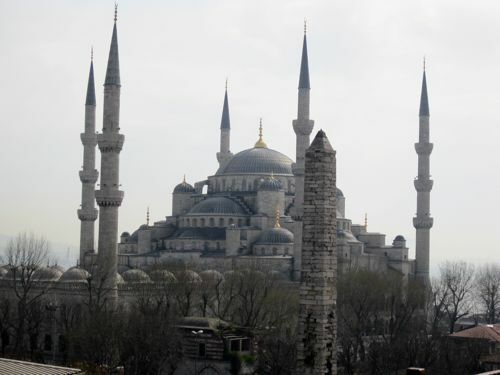 The Blue Mosque in Sultanahmet is the only one with six minarets (one is hidden). 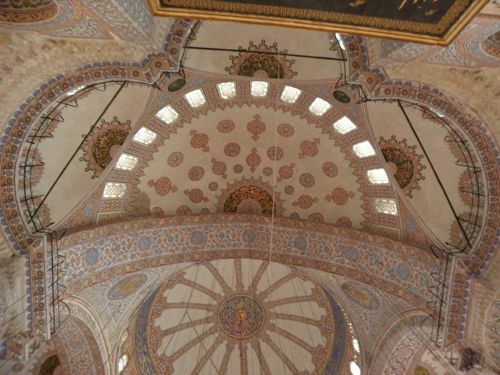 We could barely hear the call to prayer back then at the Koç School, though as the city encroached on that easternmost “suburb,” more mosques were built and the call to prayer became a part of our soundscape (along with jets flying over). Here in Arnavutköy I wake to the ezan (call to prayer) before sunrise, though I usually go back to sleep. I love hearing it repeat throughout the day. There are six different times that the muezzin (crier) sings the call to prayer through a loudspeaker in the minaret. When I first came here, I thought they must be recorded and played electronically, but I was wrong. Each mosque’s muezzin is trained to fulfill his duty of singing phrases from the Koran to call Muslims to leave their daily tasks, face toward Mecca, and worship Allah in prayer. The ezan is chanted at different times each day, depending on sunrise, sunset, longitude, and latitude. The exact same verses and music are repeated from every mosque in the city at the same time. It’s amazing when you’re in an area with many mosques, as they’re a bit out of step, so it sounds almost like echoes. From my apartment I can hear a few faint ezans from across the Bosphorus at the same time as the one from the Arnavutköy Mosque, loud and clear. 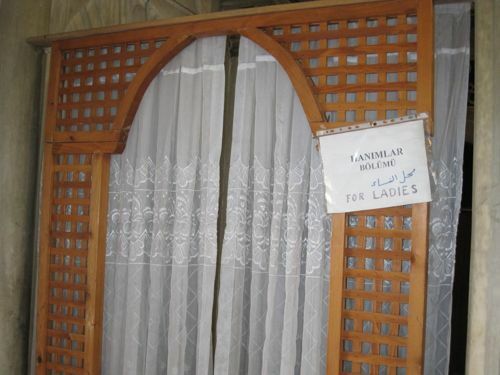 A separate space for women to pray at the back of the mosque. A Muslim is expected to pray five times each day to Allah (God—the same one worshipped by Christians and Jews, by the way), so I guess they throw in that sixth ezan for good measure. Maybe it accommodates early risers versus the night owls. I really don’t know. 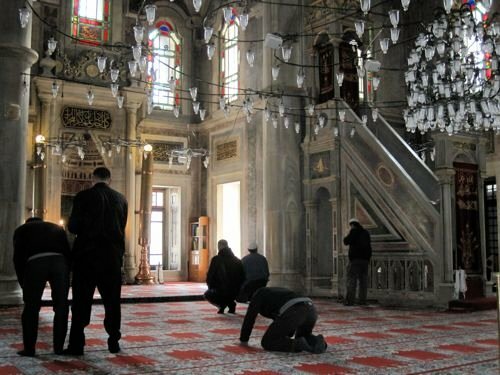 Only a minority of Turks pray five times a day; this kind of devotion is more common in Eastern Turkey and among recent immigrants to the city. In Istanbul habits range from no prayer to full compliance. 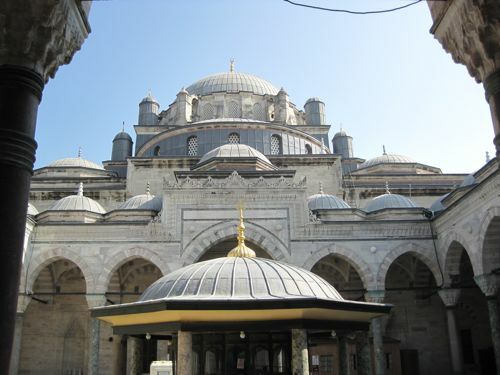 Friday is the Islamic holy day, so that’s when many visit the mosque to pray. 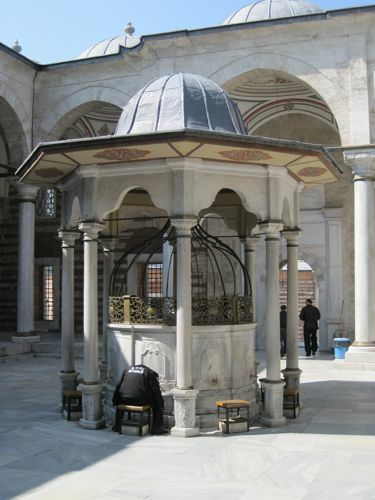 People first perform ablutions, washing their feet, hands, and head at a fountain in the mosque’s courtyard. The main prayers are held at Oğle (noon), so mosques are the most likely to be busy then. The imam, the prayer service leader, will often give a sermon as well. I find the call to prayer captivating—it’s one of the things I miss when I leave Turkey, and I can’t help but be moved by it when I’m here. I know some people find it irritating. I have to admit, if you’re near a mosque during the ezan, there’s often no point in trying to talk over it. People manage. 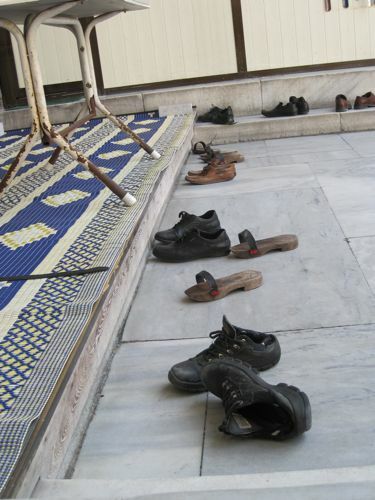 Shoes remain outside when you enter a mosque. Four years ago my friends Dee, Terri, and I stayed in a hotel in Trabzon (NE Turkey on the Black Sea) during Ramazan. We were relaxing with an evening glass of wine when the call to prayer blasted us from a loudspeaker mounted directly outside the window. We clapped our hands over our ears, it was so loud. Since it was the final weekend of Ramazan, it went on and on and on and on. 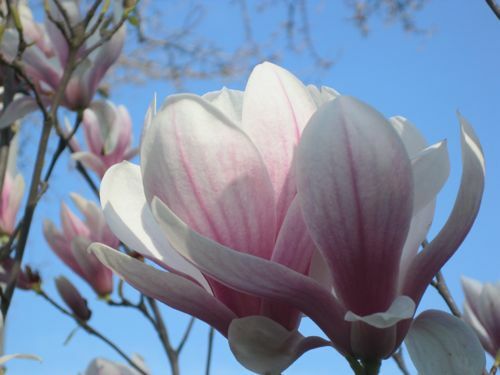 We heaved a sigh of relief when the singing finally stopped—but there was more! An endless sermon finally drove us from our room. Oh, my goodness! No WONDER that hotel was such a bargain! As I see rabid reactions to Islam in the United States (and in other Western nations), I can’t help but feel frustrated. I know Turkey is a secular country, probably the most liberal of the Muslim countries, yet I am dumbfounded at the prejudice that has arisen from a knee-jerk reaction to Islamic extremists. The Islamic faith is a peaceful faith, one that combines a worship of God with service to others. Makes sense to me. Now, I wonder, who can find fault with that? 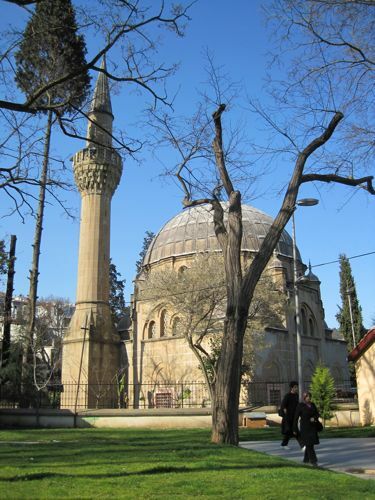 Here is a recording I made of the call to prayer in Bebek while Libby and I were enjoying the park. Each separate phrase usually has a long pause before the next one, but I’ve edited them out to shorten it. The call to prayer usually lasts around four or five minutes, but this recording is only about a minute. You can still hear the voices and activity in the park. Life goes on, doesn’t it? So—there you have it, The Call to Prayer in Istanbul. A bit of the Turkish soundscape. 1 Sansal, Burak. “Islam in Turkey.” All About Turkey. Burak Sansal Tourism, 2010. Web. 1 Apr 2010. <http://www.allaboutturkey.com/islam.htm>. You’ve made me think of a few things that I hadn’t contemplated in a while…and you know the sound of the call to prayer is one of the things I miss the most about living in Turkey. It just always seemed to signify to me that I was living somewhere else (should I say exotic, I’m not sure). 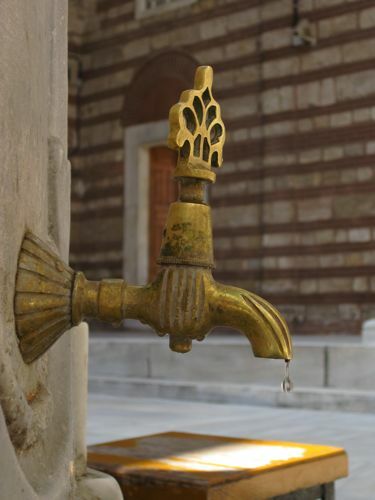 And the picture of the spigot dripping water is superb!